Sathiguru Maharaj Sahib Jee says that the pride you have in power, worldy power, raaj, in political power over others, or economical power over others, that is kapatta(n). Kapatta(n) literally means that it's a deception. It seems to you like it's real, it seems to you like you have power, like you have all this on your hands, but it's not in your hands. If you're repressing people, then you will receive the fruits of your actions. Roop kapatta(n). If you are to think I'm so beautiful, even that is a deception. Beauty will not remain forever. Power doesn't remain forever. One government comes, another leaves. One king comes, another sits upon his throne. Dhhan kapatta(n), this pride in wealth is also a deception. You can only have so much money, you can't have all the money in the world. Money doesn't remain yours forever. It passes on from hand to hand. Kul garabatheh, to have garabatheh in this case means to have egotistical pride in your kul, in your ancestry. To say I am from such and such caste, or my ancestors are better than yoursbecause of this and that. Guru Sahib Jee says how can you be proud of ancestry? Being born into the house of a doctor does not make you a doctor, being born into the house of a lawyer does not make you a lawyer. Ancestry has nothing to do with it. It's all to do with your own karam, your own actions. Guru Sahib Jee says that you sa(n)cha(n)th, you gather together bikhiaa - poison. What poison do we gather together? Shhala(n) shhidhra(n), of deception and of hatred towards others. We gather together the poison of this Maya, of this illusion. We gather together that which will not go with us, worldly wealth, worldly power by deceiving others, by repressing others. Guru Sahib Jee says Naanak, Sri Guru Arjun Dev Jee Maharaj tells us, bin har - without Hari, without Waheguru, sa(n)g n chaalathae, nothing is sa(n)g, nothing remains with you when you leave this earth. When we paekha(n)dharro, when we look at a thu(n)maa, thu(n)maa is a fruit found in many places in Punjab. It looks like it's going to be very juicy and very sweet, sohanaa Guru Jee says, that it looks very sohanaa, it looks very beautiful and tasty. But really, when you bite into it, you realise that it's very very bitter. More bitter than a lemon or any of these things. Extremely bitter. Guru Jee says that we look upont his world and we think it's so beautiful and juicy, beauty or power or wealth or ancestry, all of these things, but Guru Jee says they are like the thu(n)maa, they look beautiful, but inside they are bitter. Why do you sa(n)jeeai, why do you get together that wealth, that illusion, chaladhiaa naal n chalai, which does not go with you when you chaladhiaa, when you leave this earth. Why do you so do much jathan, so much effort to gather together in this world? Jis thae va(n)jeeai, which you're going to va(n)jeeai, va(n)jeeai means which you're going to leave behind in the end. By bisariai, by forgetting Waheguru; What is Guru Jee talking about here? Guru Sahib Jee is talking about those ways of getting together maya, which are hurting others, and getting maya together for greed, money for greed, wealth for greed. Guru Jee says get together as many worldly goods as you need to live. Do not have greed for more and more and more and more. If you have worldly goods, share them with others. Put them into the service of Waheguru. Har bisariai, but those worldly goods which bisariai, which make us forget about Hari, about Waheguru, kio thripathaavai, how are we going to find satisfaction? We can never find fulfilment if we've forgotten God. Naa man ra(n)jeeai, your mind can never be ra(n)jeeai, can never be fulfilled without Waheguru, without meditation upon God. If we shhodd, if we give up Waheguru, and laagai, attach ourselves to others, narak sama(n)jeeai, we are sama(n)jeeai, we are plunging into, we are immersing ourselves into narak, into hell. It is hell to forget Waheguru. It's hell to attach ourselves to anything except Waheguru. O compassionate Waheguru! Hohu, please be kirapaal dhaeiaal, compassionate, kind to me, please bless me with your grace, O merciful God. Naanak bho bha(n)jeeai, Sathiguru Arjun Dev Sahib Jee says You are The One Who can bha(n)jeeai, Who can cut through all of these bho, all of these fears. You are The One Who can take me out of this hell of forgetting God. 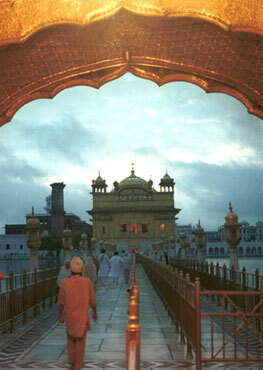 Only You Waheguru can save me, please bless me, please save me from all of these bho, from all of these fears. Give me Your hand, and protect me.